Yudanaka is Onsen (hot-spring) town near the Snow Monkeys. The artificial marble which was made with technique same as Opera of Paris. Roof tiles same as the Chinese Forbidden City. Ceiling of the lobby where one piece of gold leaf of 5 square centimeters was stuck on. It is like the castle which God totally collects world treasure things and made here. The bulding that it may be said with the work of one made of the thought to want to make a thing staying in the history that architects and creators invited form all over the world want to introduce one's work into in history. The hotel which was full of the original world won the sixth Togo Murano Prize awarded the superior building in 1993. All things to see are space of the art. It is the reason why this hotel is said to be an art museum hotel. Momoyama Bath (An important cultural property) and open-air big bath, and more. The large bathhouse made of Japanese Umbrella Pine, which is believed to be the sacred tree of Mt. Koya. The pictures of legendary wizards drawn , who is a potter. There's no open-air bath in the large bath and there's time for men in the morning and time for women in the evening to use it. *We alternate Gentlemen and Ladies according to the time of day. Comfortable space of relaxation for Adults. 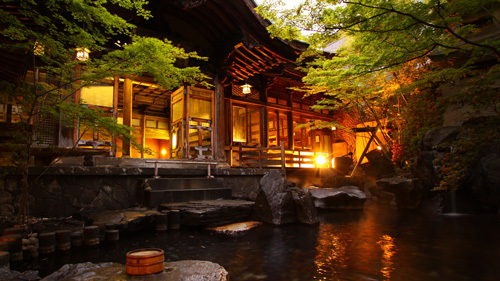 There are rooms also with a Tradisinal japanese room and Outdoor Bath for the comfort as a residence. You can enjoy Japanese foods in a dining room with a unique interior decoratio. You can enjoy delicious food in an elegant environment with things like a sculpture made by hand and the floor. Please note that smoking is not allowed in the entire room. Access: 15 min. by car from Shinshu Nakano IC. 7 min. by walk from "Yudanaka Sta."